1 of 1 In a small bowl or measuring cup, combine vinegar, scallion, ginger, mustard, salt and pepper. While whisking, add oil in a thin stream, beating until well blended. 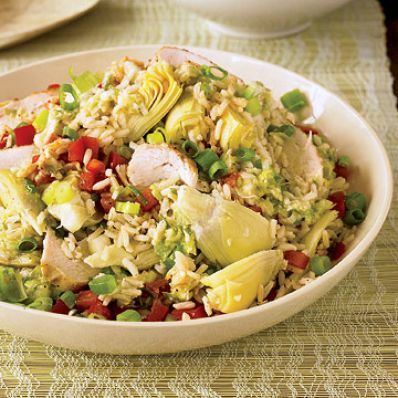 1 of 1 In a large bowl, combine artichoke hearts, brown rice, chicken, barbecue sauce, red pepper, scallion and parsley or sprouts. Stir gently to combine. Add dressing, salt and pepper and stir to blend. Serve cold or store in air-tight container in refrigerator. Per Serving: 746 mg sodium, 437 kcal cal., 27 g pro., 2 g sat. fat, 6 g fiber, 38 g carb., 20 g Fat, total, 49 mg chol.